This photo was printed on an Azo Real Photo Vintage Postcard that was typically used from about 1922 until 1926. It features a bespectacled, handsomely dressed and hatted man sitting in a dark leather chair on a geometrically patterned floor. He stares, without smile, towards the camera. The photo appears posed, with faux background, perhaps a garden scene, behind him. Taken out at Luna Park. With a little imagination it reads like a mysteriously simple haiku-like poem. More likely, however, is that it is merely descriptive. The date of 1925 matches what we already now about the paper the photo was printed on. Is Kurt Knuth the person in the photograph? Is the man from Toledo? Who was the photo given to? My best guess is that the man is between 30 and 40. What do you think? What do you think about wonder and feel as you look at the photo? 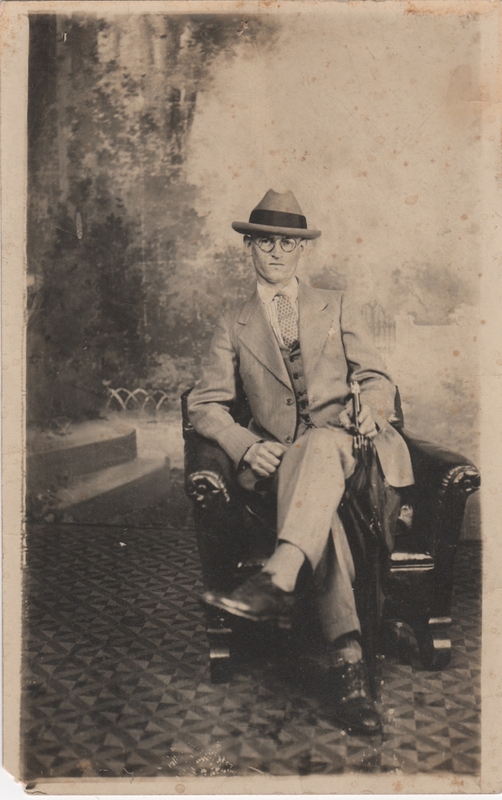 Is there a relative of this man alive today who might like to have this photograph? Though it is hard to know for sure, it seems likely that this photograph refers to one of those parks. If you check the link you will notice that there was a Luna Park, Detroit that was in operation during this time (1906-1928). It was also referred to as Electric Park. 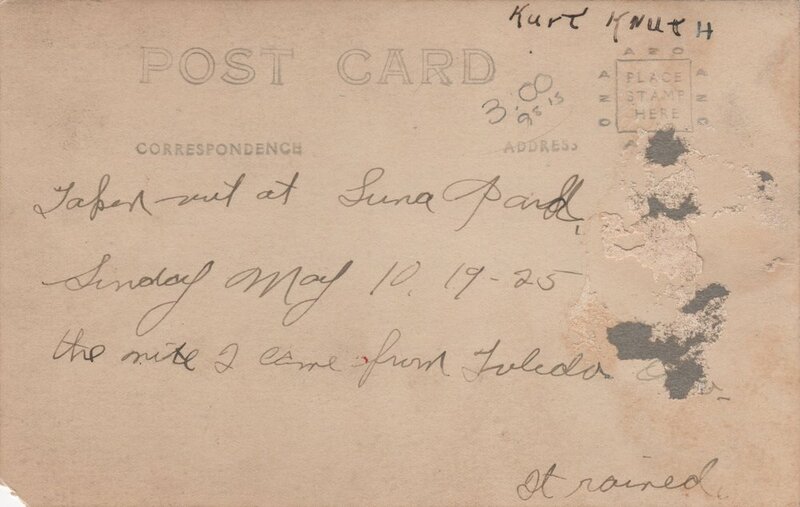 Given that this photo was obtained from a book store in downtown Detroit, and that the postcard refers to coming "up" from Toledo (to Detroit's south) it seems like a good chance this is the location. There are dozens of entries in Ancestry.com for "Kurt Knuth" in different parts of the country. It is hard to know, without more details, which one, if any, this gentleman might be. If it was Detroit, we do know that it rained that day. The front page of the Detroit Free Press for May 10, 1925 indicated, simply, that the weather was "Showers". There is a lot more that could be investigated here. If you feel the urge please have at it and let me know what you discover. Tragically, Anthony Karatzis (Karr) was struck and killed by an automobile before his 5th birthday. This is his story. In the summer of 1949 Georgia Vakendis (1929-2001), my 2nd cousin 1x removed, won a free pint of Cunningham’s Famous Ice Cream. This is her story. Helen Borowski Nizol left 4 young sons when she died at age 34. Her own mother died when she was only 10. This is her story.